COMMUNAL leaders have welcomed the opening of a new Australian Trade and Defence Office in Jerusalem as a sign of Australia’s continued commitment to recognising Jerusalem as Israel’s capital. 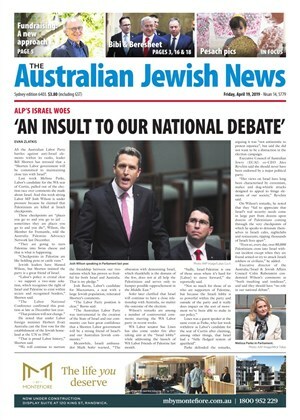 AS the Australian Labor Party battles against anti-Israel elements within its ranks, leader Bill Shorten has stressed that a "Shorten Labor government will be committed to maintaining close ties with Israel". THE Australian Broadcasting Corporation (ABC) has upheld an Executive Council of Australian Jewry (ECAJ) complaint relating to a misleading headline, "Israel attacks targets in Gaza following signing of Golan Heights proclamation." 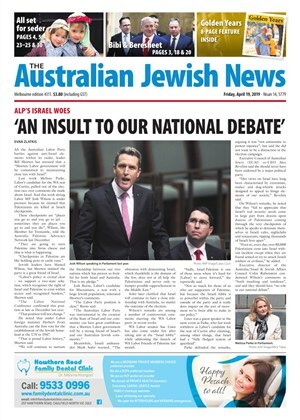 JEWISH leaders have expressed their disgust at a gibe by a Greens staffer working for Macnamara candidate Steph Hodgins-May that deaths in Gaza were Israeli "genocide". JEWISH leaders have expressed their outrage after a string of swastikas and antisemitic remarks were daubed across Sydney late last month. POLICE are appealing for information after a series of neo-Nazi symbols and antisemitic remarks were sprayed on a Sydney laneway. SCOTT Morrison's government has received kudos from the Jewish community for its stand against a spate of anti-Israel resolutions by the United Nations Human Rights Council (UNHRC). JEWISH community leaders in Australia have condemned a barrage of Hamas rocket attacks against civilians in central Israel this week.